NASA's latest mission to Mars, MAVEN (Mars Atmospheric and Volatile Evolution), entered Martian orbit less than a month ago on September 21. It's already begun to reward us with revealing insights into the disappearance of Mars' atmosphere. MAVEN is the first spacecraft designed to investigate Mars' outermost atmospheric sheath, the rarified "corona" of gases that come into direct contact with the solar wind, the stream of electrically charged gases blown off by the sun. Until now, robotic missions have been concerned with Mars' surface conditions: composition of rocks and soil, mineral deposits, topography, sedimentary layering, and surface weather and climate, not to mention keeping an eye out for signs of life, past or present. The intensive investigation of Mars' surface over the decades not only introduced us to a cold, dry desert planet, but also revealed that it wasn't always so. Long ago in Mars' past, the evidence tells us, the climate was much more Earth-like: a thicker, warmer atmosphere, lakes and seas of liquid water, precipitation and runoff. And, most tantalizing of all, conditions suitable for sustaining some form of life. What happened to change Mars so drastically? The stark difference between the planet we see today and the world of the past that we have reconstructed posed the question, what happened to change Mars so drastically? Today Mars' atmospheric pressure at ground level is over a 100 times thinner than Earth's, unable to hold much heat and too thin to support surface water in liquid form. There is a lot of water on Mars, we have found, but it's all locked up as subsurface and polar ice. A planet's climate is largely determined by its atmosphere, so scientists have sent MAVEN to explore why Mars has lost so much of its gaseous cocoon. 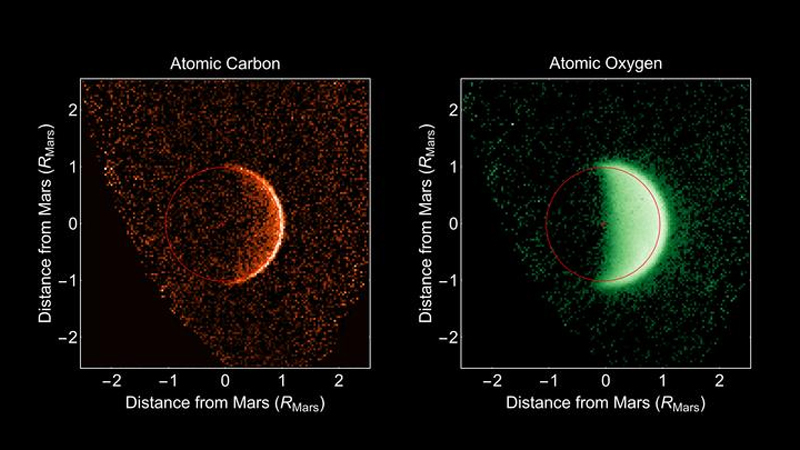 Early returns from MAVEN's Imaging Ultraviolet Spectrograph have shown us the "coronas," or thin, highly extended envelopes of gases stretching into space from Mars. The instrument allows scientists to map the coronas of specific gases, like oxygen, carbon and hydrogen, the byproducts of the breakdown of water and carbon dioxide molecules. The process scientists believe is responsible for the slow leak of Mars' air, and what MAVEN has been sent to investigate, is the interaction of the high-energy particles of the solar wind with molecules at the top of Mars' atmosphere. Solar wind particles—mostly protons--would impart their energy to atmospheric molecules, essentially giving them the boost needed to escape Mars' gravity. On September 26, a coronal mass ejection (CME) -- a powerful blast of high energy particles -- erupted from the sun into space, and NASA scientists predicted that it would impact Mars on September 29. MAVEN successfully measured the CME's arrival at Mars on the predicted day. Once MAVEN enters the full science investigation phase of its mission, sometime in early to mid-November, it will also be able to observe in detail how such blasts of high energy solar particles actually interact with Mars' atmosphere and verify the suspected mechanism of Mars' atmospheric demise. In other Martian news, on Sunday, October 19, the comet C/2013 A1 "Siding Spring" will pass within 85,000 miles of Mars—one third the distance between Earth and the moon—and there is a chance that particles in the comet's tail will sweep over Mars. 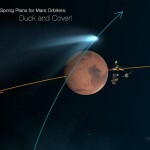 This not only poses some risk of impact by high-speed dust particles with orbiting spacecraft, including MAVEN, it also gives those spacecraft the chance to observe the interaction of a comet tail with a planet's atmosphere.